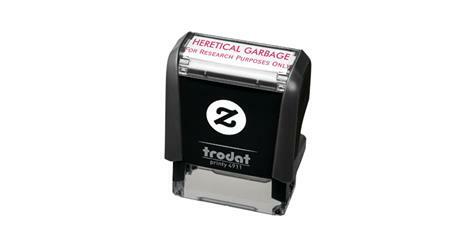 Some time ago, I came across an image of a rubber stamp that said “Heretical Garbage; For Research Purposes Only.” You can use this stamp to mark any books you have that are heretical with it, that way you can have these books safely on your shelf without any worry. I tried looking on the internet for this stamp but couldn’t really find one, at least nothing affordable. So I decided to make a version that is affordable and allows you to pick whichever size you want. Over at the Traditional Roman Catholic Thoughts Zazzle Store, you can find this rubber stamp is six different sizes and styles. You can also click on the below image if you’d like to go directly to the page and view it. This stamp would make an excellent gift for yourself or a friend who has a lot of books they don’t want to get rid of necessarily. It would be great to use for Pope Francis’ Amoris Laetitia or those Matthew Kelly books, specifically Rediscover Jesus. Hilarious! I usually sell or give mine away or, if they’re bad enough, enjoy the BTU’s they have to offer. I know people who could use this!! Love it! Definitely considering getting a few of these to give as gifts!